The complex named Nelson Dukedom, is at 13 Km from Bronte, placed on flat land alongside the left bank of the torrent Saraceno. 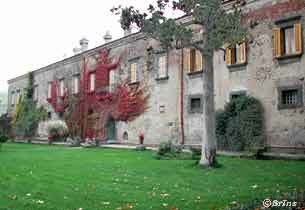 Comprises the noble wing, once residence of the Nel­son, (the Castle) now changed in a Museum, the remains of the ancient Benedictine Abbey, dedicated to the Very Holy Mary, built by Guglielmo II° the Buono, the little church of Holy Mary Of Maniace and a large, very lush park. 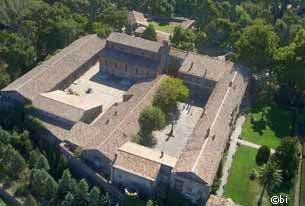 Was built around the 1173, probably over the ruins of a pre-existent Basilian construction, as wanted by the queen Margherita, in everlasting memory of the victory in battle of Giorgio Maniace against the Saracens. As it was usual at the time, the monastery had a castle or defensive tower. Guglielmo di Blois was the first abbey of the monastery. The abbey, for the obtained privileges had some considerable income and, as for all feuds, participated to the Royal Curia. In the centuries following the founding went through hard times: was reduced in a miserable state by the "commen­datory", (the last "commendable" abbey was the cardinal Rodrigo Borgia, future pope Alessandro VI, "of wicked and inauspicious memory"), all properties were squandered and the unhealthy state of the areas accelerated considerably the depopulation of the nearby farms. At the end of the XV century the abbey, with all his land, became property of The Big and New Hospital of Palermo, until 1799 when was given by Ferdinando III to Admiral Horatio Nelson for having repressed the Neapolitan republic. The earthquake that on 11 January 1693 hit eastern Sicily, destroyed also several parts of the monastery. The seism hit particularly the structures facing east and destroyed the large defense tower adjacent to the church apse, knocking down other dilapidated parts. 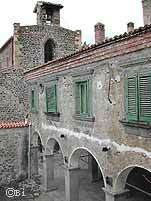 The Basilian fathers, that conducted the monastery at the time, were forced to leave it and move to Bronte (guest to the church of San Blandano, with permission to build around it a small monastery). In the new locality, the Benedictine monks brought all their of worship objects, their relics and kept calling themselves "of Santa Maria di Maniace", (their last abbey was Brother Giacomo Cimbali between 1900 and 1904). The descendants of Nelson, with disinterest, greed and incredible rapacity, for centuries conditioned the life of the Brontesi generating a quarrel that will drag, with alternating fortunes for the City, until the mid-twentieth century. 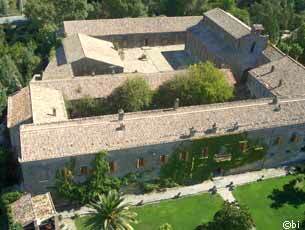 The current plan of the ancient Abbey is the final result of their permanent settlement, which lasted from 1799 to 1981. The restructuring, transformation and enlargement were begun by Horatio Nelson, (he entrusted the task to his first administrator, the gardener Andrea Graefer) who, however, had neither the time nor the good fortune to set foot in the Sicilian possessions and to live in Bronte. In fact, he died in October 1805, a few years after obtaining the title of Duca di Bronte. His heirs, however, and their various administrators, permanently lived until a few decades ago the apartments, gradually transformed into noble residences, now destined to Museum (the first was Charlotte Nelson-Bridport, daughter of the Reverend William Admiral, married to Samuel Hood, viscount of Bridport). 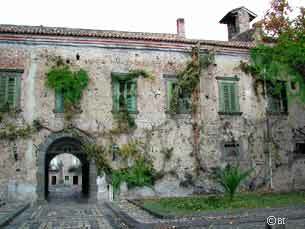 Today, of the ancient Benedictine settlement, remains only the Nelson Castle (with the Museum, the garden and the Park), the ruins of the old abbey and the Chiesa di Santa Maria di Maniace. The building complex has become property of the Council of Bronte from the 4th of September 1981; it has been recently restructured with one section used as Museum (the Duke' apartments) and as a center of studies and congress (the old granaries). 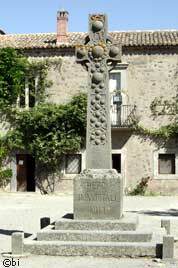 is the final result of the permanent settling of the Nelson, from 1799 to 1981. The recon­struction, transformation and the enlarging of the ancient abbey to a sumptuous, noble residence was started already by Horatio Nelson, that did not have the time or the luck to ever come to his Sicilian estate or to live in Bronte. His heirs, instead, and their administrators, lived permanently, till few decades ago, in the apartments changed now in Museum, (the first one was Charlotte Nelson-Bridport, daughter of the rev. William, the admiral's brother, married to Samuel Hood, viscount of Bridport). is articulated as a ring-like plan with a square perimeter and edifices with one or two floors, lined along outside fronts, that look on the country and on two internal, rectangular courtyard. The all thing, in its simplicity, looks majestic. 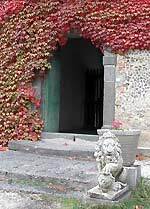 Two railings lead to the entry arcade and then to the courtyard where there is the lava stone cross erected in memory of Orazio Nelson. Laterally, to the right, leads to the interesting late-Norman church of Santa Maria and to the square courtyard with a lava stone well, around which, originally were the small workers rooms, the stores, the stables and the granary. On the first floor, to the left, there were the noble apartments of the Nelson, now used as a museum. Outside the complex can be seen the ruins of two small towers, part of the defensive system of the abbey. 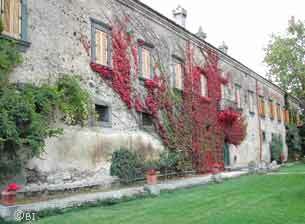 A large park, that covers, internally and externally, about four hectares, enriches the Castle. 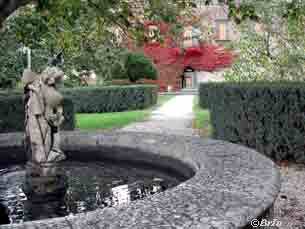 From the first courtyard it is possible to visit the English garden, wanted by the Nelson: covers about five thousand square meters and enjoys the presence of centuries-old, local and exotic plants (cypress, palms, willow trees, ash trees, horse chestnuts, magnolias), an English green lawn bordered by wisteria, roses, flowers and various plants. 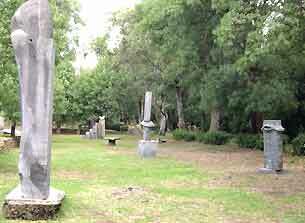 Opposite the entry there is a lush park, divided by a central path that, between the majestic plane trees and eucalyptus, holds an open air museum of lava stone sculptures. The park-museum is open to the public and is regularly visited by scholars, students and cultural and tourist operators. In the park can be seen the ruins of the farmers village, called "Borgo Caracciolo" and built from 1941 to 1944 by the Italian state (the Dukedom had been then seized) and demolished in 1964 by the Nelsonis bulldozers. 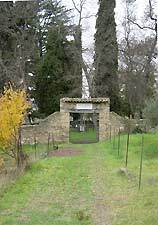 The small English cemetery, near the Castle, was built in 1898 for the Nelson family and its administrators. It represents the only property in Bronte still belonging to the Nelson and it has been given in concession to the Maniace municipality that wants to manage it for cultural and tourist purposes. The writing at the entry reads: “Nobisque vobisque pax”. The Nelson’s small cemetery has eight graves, Besides the ones of the dukes and other noble Englishmen, there also lies the poet William Sharp (a delicate exponent of English Romanticism, Paisley, Scotland 1855- Maniace 12/12/1905), who died during his stay in the duchy, guest of the 5th duke Alexander Nelson Hood. The entry to the botanic garden of the Duke with the windows of the noble apartments. The park in front of the Castle and one of the lava stone sculpture of the Open Air Sculpture Museum. 2) Alexander Nelson Hood (the intelligent and refined V duke of Bronte, born June 28, 1854, died June 1, 1937 in the villa "La Falconara" of Taormina) and Rosa Penelope (his sister, the last of the females of the family, died too in Taormina on March 17, 1922, it was born in 1852). 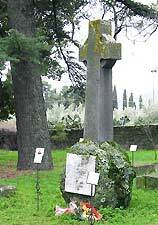 The two were first buried in the garden of the villa of Taormina but when, on April 27, 1948, the villa that the Nelson possessed was sold to Count Marzotto, the bodies of the Duke and his sister were transported and buried in a single tomb in Maniace; the tombstone and the monumental cross (with the word "Peace") were also transported from Taormina to Maniace. The tomb of Rosa Penelope (on the right in a drawing of 1879, taken from the Nelson Archives) bears the following inscription: Here in the flowers she loved rest Pink Penelope the Honorable Mrs. Evans ... Devoted and beloved daughter and sister constant friend, 1852-1922 (Here, among the flowers he loved rests Rosa Penelope, honorable Mrs. Evans ... Daughter and devoted sister and constant friend, 1852-1922). 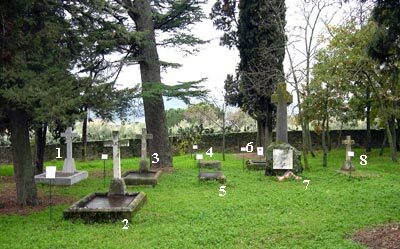 Many news on the small English cemetery are taken from "The Duchy of Bronte", the "memorandum for the family" written by the same V ° Duca. 3) Victor Alberto Nelson Hood (November 14, 1862 - Taormina May 1, 1922), younger brother of the V Duke, assisted his brother in managing the Ducea for years. "A minor son of General Visconte Bridport, duke of Bronte and godson of the great Queen Victoria. 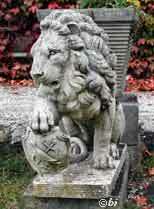 He was at the service of his king and his country in Australia for many years, and also of his family in Sicily. Alongside his brother Alex for managing the Ducea for many years. He was very loved and highly esteemed. " 3) Victor Alberto Nelson Hood 4) Richard Forsyth Gray, major and the duchy’s administrator, born the 27th of July 1881, died the 29th of July 1928. 5) Charles Beek, born the 16th January 1859, died the 6th May 1917, for 26 years was a faithful duchy’s administrator. 6) William Tredgold, loyal servant of the 4th duke Alexander Nelson Hood. 7) William Sharp, Scottish poet, born September 12, 1855, died suddenly in the Castle of Maniace on December 12, 1905. The marble plaque walled in his memory in the tomb (photo on the right) shows two lines: the first signed by William Sharp, another of Fiona Macleod. 8) Hedwin Hughes, general administrator of the duchy, diseased the 2nd of December 1922. In the cemetery are buried also three people who had nothing to do with the duchy: Montagna Capucciello Sebastiano who died for the exsplosion of a mine, and in a single grave the two brothers Antonio and Carmelo Bontempo who died the 10th of August 1943, because of a bomb dropped by an English plane over a hamlet at S. Andrea. (In that occasion some other Brontesi also died).